The northern pufferfish, which swims in bays and estuaries along the United States’ East Coast, has earned many nicknames: sugar toad, swelling toad, honey toad, sea squab. And yet, no name has succeeded in ushering this prickly fish into popularity. While the saccharine monikers are rooted in some truth (its flesh has a sweet flavor), many diners can’t look past the sugar toad’s relation to the notorious, poisonous pufferfish known as fugu. It’s true; the internal organs of the sugar toad occasionally register low levels of tetrodotoxin, a neurotoxin that exists in much higher levels in fugu. But the sugar toad’s flesh is nontoxic, and, when the fish is properly prepared, safe to consume. It’s labor-intensive work, but chefs in the Chesapeake Bay area are embracing the challenge as part of an sustainability-focused effort to utilize “bycatch” (the unwanted stuff fishermen pull up with their desired seafood haul). First, the entrails must be removed without touching with the flesh (usually fishermen do this), then chefs must behead the fish, trim the fins, and remove the tough outer membrane before any cooking can begin. The northern puffer earned its sugar toad nickname in part because it puffs up like a toad when frightened. 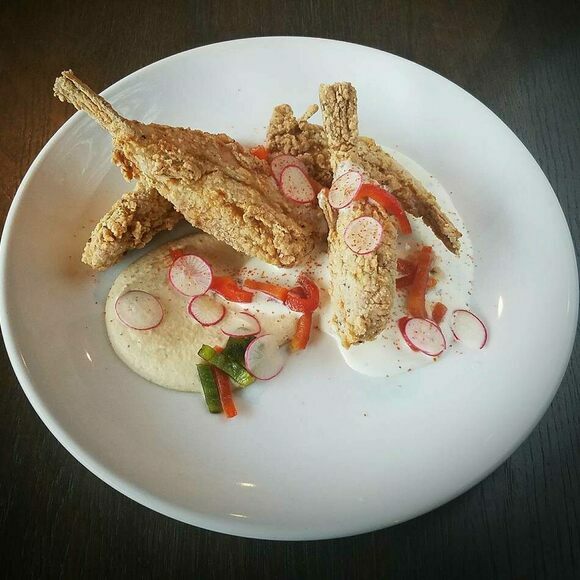 Though it always pays to check in advance, the Dabney usually offers "Fried Chesapeake Sugar Toads" on their small plates menu: https://thedabney.com/. This chewy treat became a delicacy only after Newfoundland's fishing industry collapsed. This 400-pound fish has fed Amazon tribes for millennia.